Imagine being able to manage your entire life from your mobile device, from shutting off your appliances with a voice command to getting important news just by asking for it. Whether you’re a differently-abled person who wants more independence or simply someone who is always on-the-go, the Gloria Chatbot gives users amazing new freedoms through its IoT-powered ecosystem. 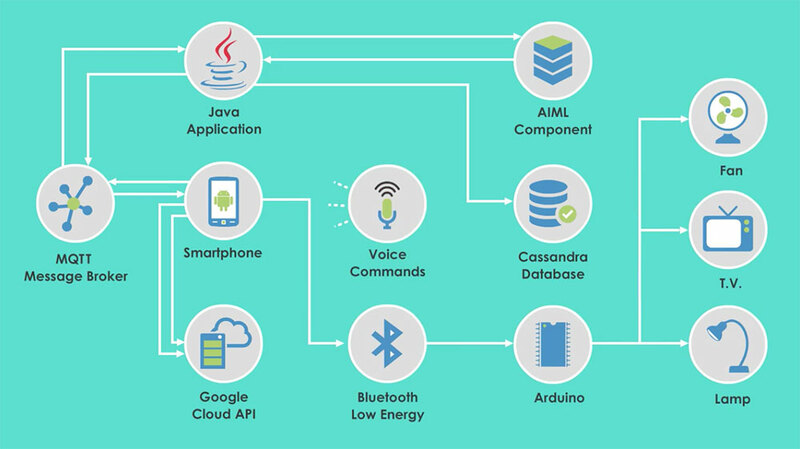 The Gloria Chatbot is based on an Arduino Uno microcontroller that is connected to a relay controller circuit with the capacity to simultaneously operate up to seven different relays. When a user gives Gloria a voice command, the signal is sent to the microcontroller via a BLE or wifi module and executed through a sophisticated system of connected networks (see below diagram). The Gloria Chatbot — which was developed by Rajeev Bhatia, Deepti Arya, Jeevenjot Singh, Jatin Lamba, Aryan Singh, and Parveen Gupta over a period of 12 weeks — was a winning proof-of-concept in GlobalLogic’s Global POC Challenge, a competition that gives our global engineers an opportunity to compete against their global colleagues and show off their design, development, and presentation skills. Learn more about how the Gloria Chatbot works and was developed in the below video.